Introduction: Explanation, in philosophy, a set of statements that makes intelligible the existence or occurrence of an object, event, or state of affairs. It is a set of statements usually constructed to describe a set of facts which clarifies the causes, context, and consequences of those facts. The components of an explanation can be implicit and interwoven with one another. Among the most common forms of explanation is a causal explanation; deductive-nomological explanation, which involves subsuming the explanandum under a generalization from which it may be derived in a deductive argument; and statistical explanation, which involves subsuming the explanandum under a generalization that gives it inductive support. Most people, philosophers included, think of explanation in terms of causation. Very roughly, to explain an event or phenomenon is to identify its cause. The nature of causation is one of the perennial problems of philosophy, so on the basis of this connection, one might reasonably attempt to trace thinking about the nature of explanation to antiquity. An explanation is often underpinned by an understanding or norm that can be represented by different media such as music, text, and graphics. Thus, an explanation is subjected to interpretation and discussion. There are many and varied events, objects, and facts which require explanation. So too, there are many different types of explanation. Aristotle recognized at least four types of explanation. Other types of explanation are Deductive-nomological, Functional, Historical, Psychological, Reductive, Teleological, Methodological explanations. In scientific research, an explanation is one of several purposes for empirical research. 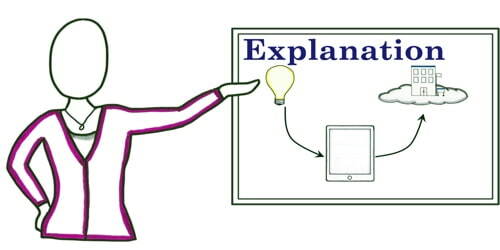 Explanation is a way to uncover new knowledge and to report relationships among different aspects of studied phenomena. Explanation attempts to answer the “why” and “how” questions. Explanations have varied explanatory power. The formal hypothesis is the theoretical tool used to verify explanation in empirical research. Arguments: While arguments attempt to show that something is, will be or should be the case, explanations try to show why or how something is or will be. Arguments and explanations largely resemble each other in rhetorical use. This is the cause of much difficulty in thinking critically about claims. There are several reasons for this difficulty. People often are not themselves clear on whether they are arguing for or explaining something. The same types of words and phrases are used in presenting explanations and arguments. The terms ‘explain’ or ‘explanation,’ et cetera are frequently used in arguments. Explanations are often used within arguments and presented so as to serve as arguments. …an argument to the effect that the phenomenon to be explained …was to be expected in virtue of certain explanatory facts. Hempel claimed that there are two types of explanation, what he called ‘deductive-nomological’ (DN) and ‘inductive-statistical’ (IS) respectively.” Both IS and DN arguments have the same structure. Criticisms – Hempel’s dissatisfaction with the statistical explanation was at odds with modern science, for which the explanatory use of statistics had become indispensable. Moreover, Hempel’s requirement that IS explanations approximate the predictive power of DN explanations has the counterintuitive implication that for inherently low probability events no explanations are possible. Another important criticism of Hempel’s theory is that many DN arguments with true premises do not appear to be explanatory. Justification: Justification is the reason why someone properly holds a belief, the explanation as to why the belief is a true one or an account of how one knows what one knows. In much the same way arguments and explanations may be confused with each other, so too may explanations and justifications. Statements which are justifications of some action take the form of arguments. For example, attempts to justify a theft usually explain the motives (e.g., to feed a starving family). Explanations of human behavior typically appeal to the subject’s beliefs and desires, as well as other facts about him, and proceed on the assumption that the behavior in question is rational (at least to a minimum degree). Thus an explanation of why the subject removed his coat might cite the fact that the subject felt hot, that the subject desired to feel cooler, and that the subject believed that he would feel cooler if he took off his coat. The Current State of the Theory of Explanation: Most philosophers of science would agree that our understanding of explanation is far better now than it was in 1948 when Hempel and Oppenheim published “Studies in the Logic of Explanation.” While it serves expository purposes to represent the DN model and each of its successors as fatally flawed, this should not obscure the fact that these theories have brought real advances in understanding which succeeding models are required to preserve. Fortunately, however, the significance of further research into the logical and cognitive structure of explanation does not depend on their outcome.